My SleuthSayers colleagues became a personal comforting presence as Florida braced for a hurricane that had already killed 800 people in Haiti. Fortunately my area was spared with little more damage than downed limbs and a 13-hour loss of power. Fixed in my mind was 2004 when four major hurricanes attacked Florida. Three of them impacted me personally but I came out of them with the most important thing, bodily intact. One other positive grew out of the devastation. Enduring endless hours without electricity, with canyons lined with debris and so many fallen trees that roads remained blocked for days and weeks, I began to write. For this Hurricane Matthew, preparations included food, water, batteries, and propane for cooking on the grill with my friend Thrush. About the time SleuthSayers started, fellow mystery author Susan Slater moved from New Mexico to St. Augustine two miles from the ocean, well within reach of the winds and surge zone. She retreated to stay with friends on higher ground. Another friend and writer, Claire Poulsen, abandoned Amelia Island for the safety of a cabin in North Carolina. But when I think of hurricanes, I don’t think of my own experiences, fortunately dreadfully dull. Instead, other efforts come to mind. The building of the Florida East Coast Railway makes a fascinating tale involving ingenious engineers, incredibly brave laborers, and an indomitable entrepreneurial spirit. During construction, hurricanes struck in the late 1800s, then again in 1906 and 1909. I have been unable to identify the date, but one of the stories involved a rescue train chased by a ’cane that didn’t take the time to turn around. The train raced up the coast backwards to avoid the deadly winds. In testament to the careful planning and design, the current US 1 Overseas Highway is partly built on footings constructed more than a century ago. The FECR sold the right-of-way to the State of Florida for pennies on the dollar following the deadly Labor Day Hurricane of 1935, the one described by Lionel Barrymore in Key Largo. The incredible engineering of a century ago was brought home in a personally observed way. Disney Cruise Line leases Castaway Cay (formerly Gordo Cay) from the Bahamian government. In taking over the private island, Disney built a pier its ships can sidle against so that passengers can come and go using gangways rather than tenders. In 1999, Hurricane Floyd swept through the Bahamas. Disney evacuated the island of the few dozen resident cast members (employees). It was with trepidation a team returned to the island where they found two surprises. In my teens, it was ‘a thing’ to visit the airport at night where we could stand out on a deck with our dates, cuddling and watching flights coming and going. Well, mostly cuddling but we could tune in speakers to listen to air traffic controllers in flat, unemotional voices direct planes amid hand-offs with ground control. NASA flight controllers use similar restrained, equable commands and commentary during launches and landings. Those passionless voices sends chills when listening to the unforgettable recordings from the takeoff of the Space Shuttle Challenger and the fiery disintegration of Columbia over Texas. The buildings remained largely intact and most of the wind destruction involved little more than shingles and lounge chairs. The real surprise was the pier. That massive hunk of concrete and steel twisted up out of the seabed like a bitter joke. The storm surge made a mockery of our so-called ‘modern’ construction. Whereas hundreds of Flagler’s railroad foundations remain intact today, this present-day foundation ended up junk. On 26 October 1998, I joined a consulting project with shore-based operations of Disney Cruise Line. The people I worked with were experienced ship’s officers, mostly captains extensively recruited from Europe and the US Coast Guard, plus a couple of South Africans and Australians. Unlike me, the other members were professional seamen. The same day I started my job, Tropical Storm Mitch became Category 5 Hurricane Mitch heading toward Honduras. Unleashing twenty days of hell, it would become one of the most unpredictable of cyclonic storms, wreaking devastation through Central America, slugging Florida, then sailing across the Atlantic where it slapped the British Isles and Iceland. It would take 9000 lives, mostly in Central America. Thirty-one of those lives became of special interest. 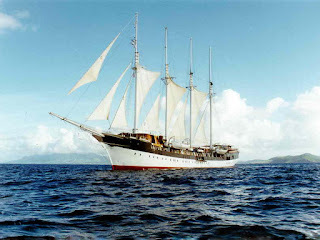 The four-masted, steel-hulled Fantôme was a beautiful ship with a fascinating history. Purchased in 1927 by the Duke of Westminster, it was later acquired by the Guinness family. At the outbreak of WW-II, Ernest Guinness docked her in Seattle. There it remained until 1953 because of unpaid fees and taxes. Aristotle Onassis, who would later marry Jackie Kennedy, purchased the yacht, renovated it, intending it as a wedding gift for Grace Kelly and Prince Rainier of Monaco. Gossip says the couple omitted Onassis from their guest list, forfeiting the lovely present. 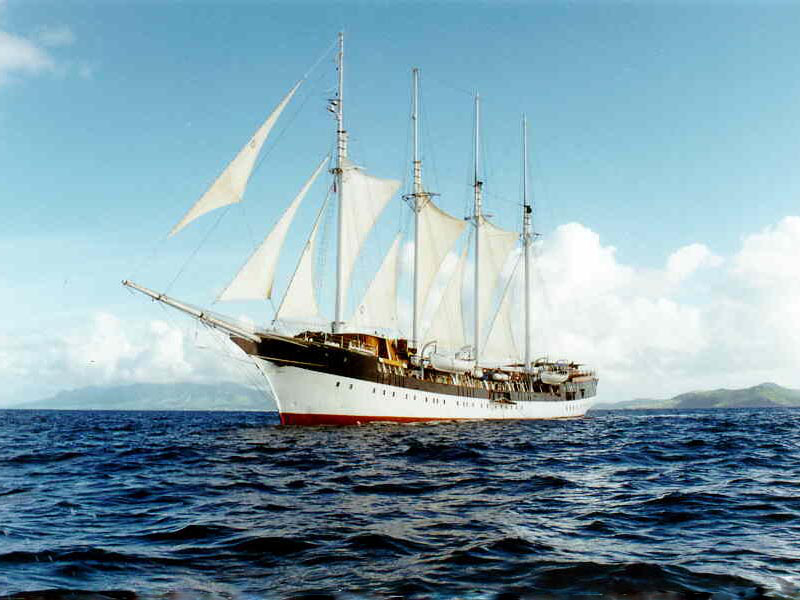 In 1969, the owner of Windjammer Cruises swapped a freighter for the schooner and spent another fortune, reportedly $6-million, refurbishing it as the Windjammer flagship. On 25 October, TS Mitch, a thousand miles distant, grew in strength and changed course toward Jamaica. As a precaution, Captain Guyan March dropped off the one-hundred passengers and ten non-essential crew at Belize City. Based upon the latest models and frankly unpredictable storm path estimates, March headed north. The hurricane stopped dead. Then it turned. The Fantôme reversed south in efforts to dodge the onrushing storm apparently driving toward the Yucatán. The captain intended to shelter in the lee of Roatan, but Category 5 Mitch with winds of 300kmph (185mph, 162 knots) veered magnetically toward the ship. A desperate Fantôme turned eastward toward the open sea. In the Disney Cruise Line offices in Celebration, Florida, the European staff had set up an espresso machine with a number of flavored syrups to supplement the coffee maker. The coffee station contained one other instrument, a shortwave radio. Upon arrival, I found the professionals gathered around coffee and charts. While tracking the hurricane and the Fantôme, they listened in on the cat-and-mouse playing out in the wavebands of the radio, the coast guards in the flat tones of men aware lives were at stake. The hurricane picked up her skirts, exchanging eye-wall speeds of 250kmph (155mph, 135 knots) for forward motion. About 16:30 on the 27th, the Fantôme relayed her position. As the storm center approached the vessel, the Fantôme radioed she was fighting winds of 100 knots and four-storey high seas. Five o’clock approached. Few standing around the radio moved to go home. And then nothing. Silence. Not silence, but a repeating call into the abyss. Through the next day. And the next. Men wore hollow looks. Women blinked away tears. Days passed. The hurricane swung north. On 2 November as Mitch took aim at Florida, the British destroyer HMS Sheffield found life-preservers and rafts bearing the stamp S/V Fantôme floating off the coast of Guanaja. The beautiful Phantom had vanished. Fascinating story about the Phantom, Leigh. And I guess we still can't beat mother nature, most of the time anyway. -- Glad you weathered the storm this time too! A good piece. I can seen an interesting detective who does similar consulting work! Thanks for sharing this, Leigh. Just got off the phone with my parents in NC--who had a much decreased-in-power Matthew pass by but in the process still got 16 (yes, 16) inches of rain and are now anticipating several days without power. Glad you're doing OK, and hope that Matthew will soon be gone and forgotten. Now that's a story. It brings emotion. We were very impressed with Governor Scott's “ hands on” approach and constant updates to this Hurricane, his handling of Zika, which he had little or no help from Congress on. Constant assurance that YOU MUST leave the coast and activation way ahead of the time to have President Obama declare a state of emergency really put the message in the right light of urgency.Should it had been what was expected this would have saved countless lives and I am sure it did on the hard hit coast. Thank you, Paul. We are amazed how little damage Orlando sustained, but we are grateful. Janice, that’s a clever thought. Art, I’m glad your parents are okay. Those storm surges in the Carolinas up through New Jersey can wreak terrible damage. Thanks, O’Neil. I’ll never be able to forget those unemotional voices, knowing what lay beneath the surface. In a bar in Zürich(!!! ), I chatted with a merchant marine captain. With a certain wistfulness, he said he’d like to face one vicious storm. It sounded like an odd thing to say, but I know what he meant. His job done well was to steer clear of foul weather, but just once he’d like to test his mettle, to make the right moves and ultimately come out the other side. As an ex wife of a Merchant Marine, Chief Engineer, I understand the intense dangers of hurricanes and water especially since I rode the ship with him on occasion. (Coast-wise only!) To me the jaws of death awaited any one who disrespected the power of the liquid we floated on. The sea is both beautiful and frightening to me. The Phantom's story is haunting (no pun intended) as is the recent demise of the El Faro, who's Captain headed out in inclement weather. Mother Nature's strength wins every time IF she wants to. One year, the captain on my ex-s ship turned about to avoid a hurricane only to have it circle around and hit them anyway. The fates allowed them bragging rights afterwards. Once, I evacuated Amelia when Andrew was on the way, carrying my mother and dogs up to Atlanta--a 13 hour trip as roads were clogged. For Mathew, I still summered in North Carolina, planning my return to the island when Mathew appeared. I tried desperately to book a hotel room for my son over three hours away to no avail. He lives off island, but Mathew's direction at that point looked like a possible direct hit. As it turned out, he stayed safely with a friend in Apalachicola. Morphing into a nail biter, I stayed glued to TV broadcasts and one Fernandina Beach local, Chad Bridges, who took video and posted on line as our blessed Amelia Islands stood in peril. The two streets behind me, by the beach, turned into canals. I chewed the nails on my left hand since the right were too short. The next street over, my street, was spared only because of the slight westward trajectory Mathew decided to take. I prayed for angels on my roof and am thankful they came through. Any further east and our entire island would have been devastated. I am grateful but feel for the islanders that will have to indoor flooded first floors and downed trees. After seeing a video of a shark swimming down a Jax beach street during the storm, I know we should all count our blessings. I feel worse for the people of Haiti and other islands and towns not as lucky as Amelia. The sea has been a part of my life for many years in one way or another. It claimed a stepson in 97 and many more on my island through the years. How can we begin to imagine, however, the life of a seaman, when mother nature begins her tantrums? I suppose landlubbers and seaman take a chance the moment they buy property by the beach or step onto a ship. But, I don't want to imagine the final moments of those on the Phantom or the El Faro who faced weather's wrath face to face. 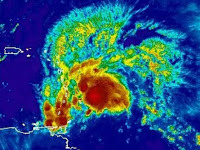 As for me, I'm thinking I'll return to Amelia in time to vote, avoiding this hurricane season best I can. I hadn't heard the story of the story of the Phantom before--gripping, and of course very sad. I'm glad you made it through the storm safely. Claire, thanks for your insight as the wife of a ship’s officer and reminding us of the dangers of storms and the sea. The El Faro loss was almost exactly a year ago and without doubt, the crew knew they were doomed. Thanks, Claire, for your unique point of view. Bonnie, thank you. I’m grateful that the drama here was no greater. Wow. The Phantom - what a story! And thank God you're safe. More importantly, glad to hear you're okay. Stay safe! Thank you Eve and John. I still feel chills hearing that Fantôme in my mind calling out as the hours went by. A sad and eerie tale. The husband of a family friend was lost, along with five others, in a Mauritius-to-Durban yacht race in 2005. It’s the ‘never knowing’ that has proved most distressing for those left behind. I know you have friends who are professional captains, Cheryl and George. That reminds me of my classmate, Don Wilson and his wife Gwen. With their greater knowledge, these stories have to be all the more poignant for them. I'm glad your friends 'dodged the bomb'! Wonderful to hear you made it through! What a chilling story about the Phantom! Thanks, Jeff. And you're right… It was chilling as it played out while we listened safely in our office building. We are what we write?